Use First Colostrum for colostrum-deprived neonatal beef and dairy calves to aid in the treatment of failure of passive transfer of immunity and prevent death associated with E.coli K99. Meets the stringent standards of the USDA-Center for Veterinary Biologics. FIRST COLOSTRUM is used to aid in the treatment of failure of passive transfer of immunity in newborn calves. 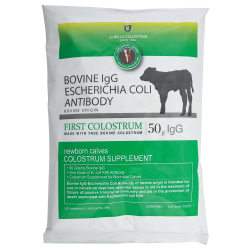 FIRST COLOSTRUM also has one full dose of Escherichia coli antibody along with 50 grams of bovine origin IgG in a 350 gram feeding to aid in the prevention of death associated with E. coli K99. This colostrum supplement for neonatal beef and dairy calves is suitable for the first or second feeding of colostrum. All natural and Anti-biotic FREE. First or second feeding of colostrum or a combination of both. Each package contains one full feeding. Mix one package (350 g) of La Belle FIRST COLOSTRUM colostrum supplement into 1.5 quarts (1419 ml) of clean, warm water 100-110°F (38-43°C). Feed to calf by bottle, pail or esophageal feeder.